Triangle UXPA - [UX Book Club] Durham Book Discussion of "Lean UX"
[UX Book Club] Durham Book Discussion of "Lean UX"
Please register for all TriUXPA Book Club events at meetup.com. We'll be meeting at Viget in Durham in the middle of June to discuss the new O'Reilly book Lean UX, written by Jeff Gothelf. There will be a Raleigh meeting too in case you can't make this one. Process is a hot topic at the moment, and for good reason. It's common that we can produce some of our best work, only to have it rejected when the client sees the finished product. Lean UX offers strategies and approaches for helping UX people figure out what they need to do and how so that we can learn what we need to know to make clients and customers happy as efficiently as possible. "The Lean UX approach to interaction design is tailor-made for today’s web-driven reality. In this insightful book, leading advocate Jeff Gothelf teaches you valuable Lean UX principles, tactics, and techniques from the ground upundefinedhow to rapidly experiment with design ideas, validate them with real users, and continually adjust your design based on what you learn. Inspired by Lean and Agile development theories, Lean UX lets you focus on the actual experience being designed, rather than deliverables. This book shows you how to collaborate closely with other members of the product team, and gather feedback early and often. You’ll learn how to drive the design in short, iterative cycles to assess what works best for the business and the user. 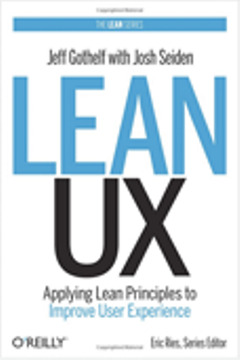 Lean UX shows you how to make this changeundefinedfor the better."